This is the month which reminds us of the Roman Emperor, Julius Caesar. Making the most of the clear and welcoming summer evenings we are going to search for some constellations which, although not particularly brilliant with stars, are rich in cumulus and nebulas (ch. 10), and which, with luck and patience, we will be able to see with the naked eye. We travel once more to the southern part of the Zodiac, to the constellation which marks the heart of our galaxy: SAGITTARIUS (ch. 10). At the beginning of July, at around 1.0 a.m., the TEAPOT of Sagittarius is more or less a hand above the area between Coria and Calzadilla; NUNKI at a hand between Calzadilla and Guijo de Coria, and KAUS AUSTRALIS a little over a hand above Calzadilla. When Charles Messier (ch. 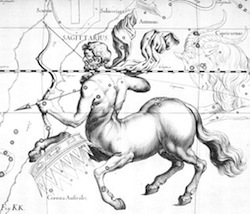 11) searched for celestial objects to classify, he found most of them here, in Sagittarius. Approximately a hand above Kaus Australis one can devise as a kind of stain M8 (nebula LAGUNA) and M20 (nebula TRIFIDA), and a little higher to the left, M24 (LITTLE STARRY CLOUD OF SAGITTARIUS). OPHIUCHUS and the two halves of its SERPENS (ch.19) extend from Guijo de Coria to a little past Moraleja, and covering a height from almost two hands to a little over three. The Serpent’s head, about three hands over Moraleja and also here, but at about two and a half hands. UNUKALHAI. Half a hand underneath and a little to the right is M5, one of the most striking globular clusters of the firmament. RAS ALHAGUE is a little over three hands above Calzadilla, and ALYA, which marks the end of the tail, at about two and a half hands above Guijo de Coria. If we continue to raise our eyes above the zenith we will find the SQUARE OF HERCULES, or the CORNERSTONE (ch.24) at four hands above the area between Huélaga and Moraleja. RASALGETHI at a little over three hands over Moraleja and KORNEPHOROS at three and a half over Huélaga. At approximately half way on the right hand side of the Square of Hercules is M13, the most brilliant globular cluster of the Northern hemisphere. 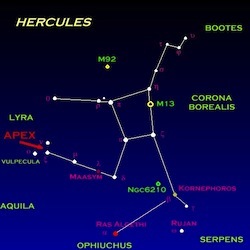 And whilst we are here, between the Serpent’s Head and the Square of Hercules, we can see the semi-circle formed by the seven stars of the CORONA BOREALIS (ch.23) with GEMMA and ALPHECCA at a little over three hands above the countryside of Perales del Puerto and Moraleja. And so until next month, which will be full of stones.